Donnie Cates is one busy man. 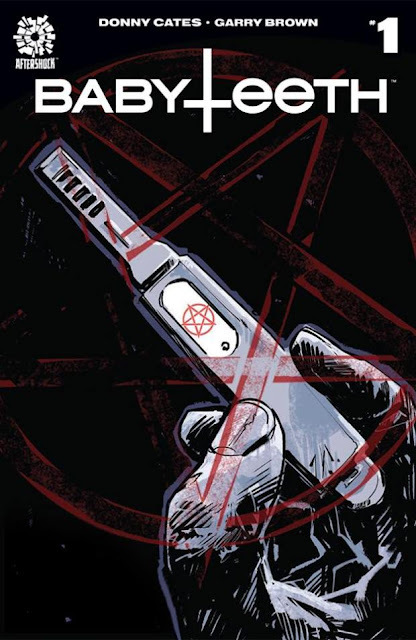 As if writing two concurrent titles for Image Comics - Redneck and God Country - wasn't enough, Cates has found more time and inspiration to pen one for AfterShock Comics. That's where 'Babyteeth' #1 comes in. It's the latest page-turner from one of the hottest creators in comics. This is Sadie Ritter's story. A first person account as told to her smartphone recording a video for her new offspring. The teenager recounts the incredible details leading to giving birth to the antichrist. That's right, the antichrist. At this point, you couldn't blame Cates for going hog wild with the supernatural fireworks from riding a wave of success and critical cache in his career. Instead, Cates shows some restraint adhering to some professional discipline and lets the story unfold quietly. With any pregnancy, there's enough anxiety and stress to deal with. Imagine your water breaking unexpectedly and having your older sister rush you through traffic while the earth moves beneath your feet. Cates lets Sadie command her story without rushing the pace or using any gimmicks to shock or even show many otherworldly scares. It evolves organically while starting slow and picking up speed until the very end. Cates delivers a gripping read without giving away anything in the process. It's almost Hitchcockian in the way he conducts a seemingly normal situation into one riddled with mystery and suspense. Co-creator and artist, Garry Brown, uses his signature style to produce some innovative layouts that energize the story and build the intensity. Amid the heavy inking and Mark Englert's bold color choices, Brown grounds the story with perfectly conveyed expressions of pain, worry, surprise, joy, and sadness. We cling to every caption and dialogue box from letterer Taylor Esposito as Sadie narrates her tale. 'Babyteeth' reads like a tasty appetizer that doesn't satiate your appetite but makes you hunger for more. There's still so much to the story that Cates is holding back you can't read this and not demand to know what happens next. Engaging characters, mysterious dark overtones, innovative art and the inevitable coming of the antichrist helps make 'Babyteeth' a must-buy. Donny "All I do is win win win no matter what" Cates keeps rolling in 2017. From Donny Cates, the writer of Buzzkill, Paybacks, Redneck and the break-out hit God Country comes a pulse-pounding new series with art from THE REVISIONIST’s Garry Brown!